Best of all, this kit comes in 25 different shades -- so no matter what your skin tone, you can find the kit that's perfect for you. This giveaway has a retail value of $79. To enter, use the Rafflecopter widget below. Good luck! This giveaway ends on Monday, August 19 at midnight. ONE WINNER will be chosen AT RANDOM on Tuesday, August 20 and notified by email. Maximum of SIX ENTRIES (one for each way listed above). Multiple entries will be disqualified. Giveaway is open to US residents only. Great giveaway so far I have used their green primer and eyeliners. I love them both would love to try more of their products. This looks awesome! I'd be curious to see if it would help with some skin issues I've been having! I love the lip and eye pencils. The HD products look nice! I've never tried this but I've heard wonderful things about the foundation. The Make Up For Ever Fluo Night is a great product for having a little fun with your makeup! It's definitely a unique, long-lasting blend. Love this brand! Haven't tried anything to be honest, but I have my fingers crossed! I haven't tried their products before but hoping to! Love MUFE, Fave is HD Foundation! Havent tried any products yet. Hope this will be the one. I love the foundation and high definition powder. The foundation is non oily, which is a must for me and the high definition powder really smooths everything out. You look great after using these products. You look natural and not like you have foundation. I've never tried any Makeup Forever products! This would be a great way to test them out! I have not tried it, but hope to in this prize! I've never tried any of their products before. i really like their foundations! I went to Sephora before I had some pictures taken & the HD Foundation went on perfectly and matched my skin. I kind of freaked put because the girl pulled out a darker shade for my pale skin but it went on looking completely natural. My favorite is the HD Microfinish Powder. Aqua Eyes is my fav.. I cant stop buying more colours! My favorite thing of theirs is the star powder in 944, but I haven't used a lot of their stuff. That needs to change! The HD Invisible Cover Foundation looks like it could be a favorite! The only thing I've tried and LOVED from makeup forever is their duo mat powder. Love it! The HD Foundation, Aqua Creams, Aqua Brow and Lipsticks are favorites. Great giveaway! I've yet to try MUFE but I've totally eyed this kit as a would-be, first purchase. 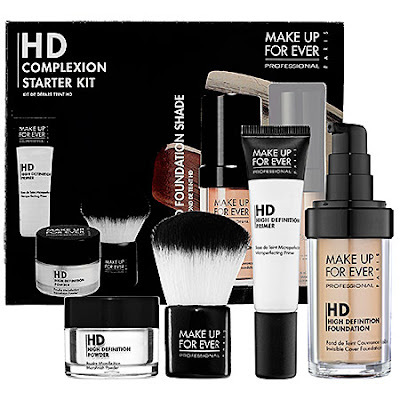 I use their HD foundation and I LOVE it! I've not tried any of their products but I too have heard good things about their foundation. The aqua line... aqua eyes, aqua lip, etc. Lab shine lip gloss too! I haven't tried them yet so I really don't know which will be my favorite. I am thinking it will be the invisible cover foundation. I haven't tried their products yet but the Invisible Cover Foundation sounds amazing! I have only tried a sample of the HD powder and I really liked it. Especially for setting my under eye concealer. This is a fantastic giveaway! Anyone know if this stuff would help with big pores? I have never used their products, this would be my chance to try. I have never tried any product from MUFE. I have looked at it, but am not sure what I would get. I love their HD translucent powder! I'd love to have some HD products for my photo shoots! I've been wanting to try their foundation! I would like to try the microperfecting primer. I have oily skin with large pores. I'm a HUGE fan of the Rouge Artist Intense lipstick range from MUFE! One of my favorite brands. I've always eyed their stuff at Sephora but have never bought anything - I would love the chance to try it out with this set! I've never tried this brand before but I think I would be most interested in trying the microfinish powder. My Favorite Make Up For Ever Product is the Mat Velvet+ Foundation for My Combo Skin. the micro finish powder is awesome!! I love MUF Aqua Eys pencils! I have never tried MakeUp Foreer, so I don't have a favorite product. However, from the sound of it, the microfinish powder would be my fave! I've Only tried the Mist and Fix Travel Size Setting Spray, but I haven't Tried any Actual Makeup. flash palette!!! The best MUFE product. I love the foundation! Its the best! the lip gloss looks great on my wife. I've never tried any MUF cosmetics before but I would love to try them! Love the HD Microfinish Powder. It's so hollywood, as if you were being filmed through a silk screen as they did in the old hollywood days. I love the Aqua Eyes Eyeliner. I have never tried MUF products, but the HD Microfinish Powder looks great! Awesome giveaway! I'd love to try MUF! I have not tried these yet,but sure would like to try them!! I haven't tried their products yet, but would like to! The Aqua Liner's are my favorite! I've never tried HD makeup, however Id like to! I wish more makeup companis would offer starter kits, especially for those wanting to use a new 'line'. I have this white glittery eye pencil from them I love. I like the HD foundation, but really hate paying $42 every two months for it! I really like their mascara! I've never tried MUFE, but I've ALWAYS wanted to! HD MICROPERFECTING PRIMER is my favorite ! LOVE to use primer...keeps my skin looking amazing! I love their HD Microfinish Powder! I Have Never Use Any Of These Products, But I Would Love To Try It Though! I really like the Aqua Cream Eye Shadows. I got a sample of their microfinish powder once and it was wonderful! Really does make the complexion look close to perfect! I have never tried their products, but I would like to. I love their Aqua Liners. Easy to use and beautiful colors. I have not tried Make Up For Ever products yet! I like their HD Microfinish Powder.